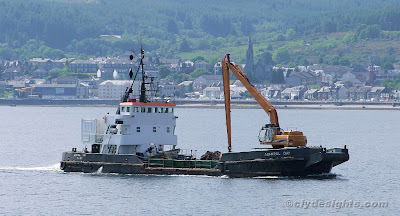 Another small dredger is now employed on the Clyde in the reconstruction of Largs Pier. ADMIRAL DAY, built by James Cook at their Wivenhoe shipyard in 1971 for Dover Harbour Board, is now operated by Wyre Marine. She is 355 gross tons, and 40.95 metres in length. The long-reach crane that she carries now is a recent addition - it replaced an older grab crane towards the end of 2008.